If it seems I’ve been talking too much about socialism lately, there’s a reason. I’ve been listening to someone who deeply believes in government. Believes it has the best interest of the people at heart. Believes it has a place in society. Believes it is necessary and usually good, even if it sometimes messes up. It’s painful for me. The mental gymnastics it takes to believe such nonsense staggers my mind. It’s disappointing because I usually enjoy listening to Scott Adams, but his recent socialism kick is extremely misguided and dishonest. Wrong is wrong, no matter who says it, just like right is right, no matter who you’re listening to. He constantly talks about how it isn’t helpful to call anyone a socialist, not even if they are loudly advocating socialism. (I consider most Republicans to be socialists, too, promoting their own vile socialist programs, so I’m not picking on Democrats. To me, they are all DemoCRAPublicans.) As I’ve pointed out, you can call me an anarchist and it doesn’t bother me, because that’s what I am, and I know it’s the right way to live. There’s no shame in being called what you are if you really know it’s right. But he also constantly conflates socialism with sharing. It’s bound to be on purpose. 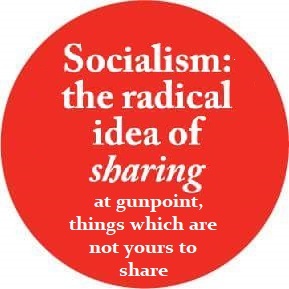 “You’re not against sharing, are you?” Every time some socialist idea comes up in his podcast, he’ll call it “sharing”, totally ignoring the coercive nature of the act. In a recent example he claimed Uber is sharing, just like socialism, so if you’re opposed to socialism, you must be against Uber, or any sharing. No, it’s not the same at all. Uber is mutually consensual and voluntary, and you won’t be forced to pay for my Uber ride. If I decline to use Uber, an Uber driver won’t come to my house and murder me for not participating. And that’s the difference between ethical behavior and socialism. And, yes, ethics matters. It’s not only about being pragmatic or utilitarian. I’m not even against socialist (or even communist) societies as long as they let anyone opt out. I believe they will collapse, but let them. People have to be free to make their own mistakes, even if they die as a result. Otherwise, they aren’t free at all. Let the socialists try socialism as many times as they want, but keep your filthy government– socialist or whatever– OFF my life.